Shelby In Colour: Purple is back! Hello everyone :) Yep the purple is back! Oh how I have missed my favourite colour .... but I must admit it has been challenging and fun using different colours. I am now at 34 followers and I would just like to say THANKYOU! I feel so special and am delighted that you like my creations enough to be a follower. Your comments and advice are much appreciated and I am thrilled that you leave so many! I wasn't going to make a card tonight ... I was busy colouring today for the next challenge at Crafting For All Seasons where I am on the Design Team (how lucky am I!). Talking about Crafting For All Seasons have you been over and checked out the latest Bingo Challenge? Its a fun one and I would love to see your creations over there. Anyway as I was saying wasn't going to do a card tonight but I won't be able to make anything at home tomorrow night as I'm going to my first ever Class at the local craft store! I'm really excited, it's my first class ever and we are going to make a Box Photo Frame with flowers on a vine. I am going to use the cute photo of my gorgeous girl wearing my slippers (see previous post) and can't wait to see the result. I really really really love this card. Yes I used the same image on last nights card and adored it! She is a little pixie/fairy from Make It Crafty called Cici. I generally colour two images if I'm happy with my colouring so that I have another one in the same colours. Thankyou for stopping by. I hope you get some time today to colour, stamp, scrapbook, create or do what you love. A lovely card Carly, cute image and great colouring, love your sentiment as well. Enjoy your class, it's always fun to get together with like minded people. Super cute!!! Thank you for playing along with my flutter by challenge! Like the cute image & your coloring. My coloring is not so great. Like the photo of your dog which looks a bit like my dog that is a mixed breed Hound & he thinks he is part Cougar. Thanks for stopping by my blog from Decorate to Celebrate. 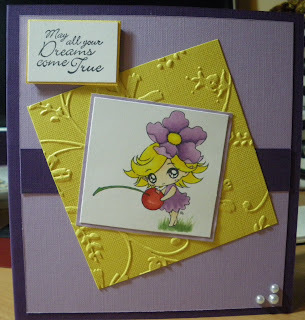 Fab card hun, love the colours & you have done a fab job with the sketch! Oh I love those colours together and that image is just soooo cute! Oh how lovely, I have to say that purple is a favourite colour when it comes to making cards. Thank you for joining us at Willow Sketchie Challenge and good luck. Woo Hoo! won myself two digi stamps over at Make It Colourful Blog for this one!